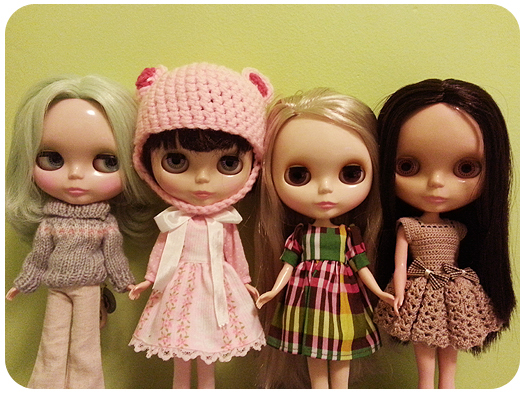 Valentine’s Day has come and gone, but that doesn’t mean that love and affection can’t be shown for the Blythes. So I looked at all the dolls that I have (Kenners and Neos – I do not have more clothes for my Middie or Petites, unfortunately) and decided that I would show a little love to the friends at I’ve made in this community by dressing up all of my dolls in clothes that have been made by some very talented people in this community. Everything being worn was handmade by someone talented and someone that I’ve actually gotten the chance to meet, even briefly, in person. The items made by me have been made possible by encouragement of people that I’ve met in through this hobby and it’s been a great source of inspiration for me. Shoes and most tights do not apply to this though, and I’ve tried to include links to Etsy/Artfire/Facebook pages where possible. Mollie is wearing a sweater knit by me and stock tights (Simply Sparkly Spark). 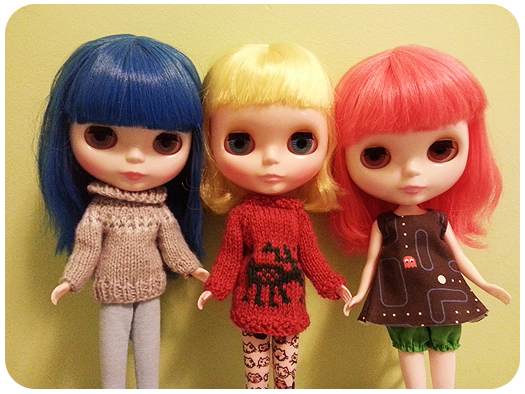 Minnow is wearing a winter-seasonal sweater dress by me and cat tights by Endangered Sissy. Moxie is wearing a dress and bloomers by Luxie Lou. Cedar is wearing a Luxie Lou dress with a pair of Fruit Punch stock capris. Kindred is wearing a crocheted dress by Charlene. Bennett, my love, is wearing a sweater dress knitted by me. Emmalynn and Prim (left and right) are both wearing Plastic Fashion. 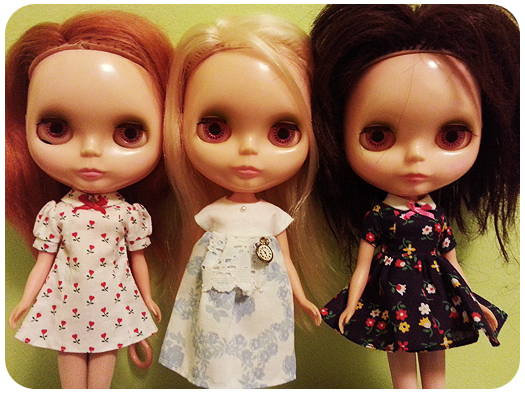 Lillian Rose (centre) is wearing an Alice-inspired dress by April. Halo is wearing puppy52 while Primrose is wearing my first PF “score” ever. Tertiary Jane is wearing a sweater by me and pants by Blythe Couture. Eden Mouse is wearing her trademark mouse helmet by me and a wonderful dress set (dress, top and bow) by Endangered Sissy. 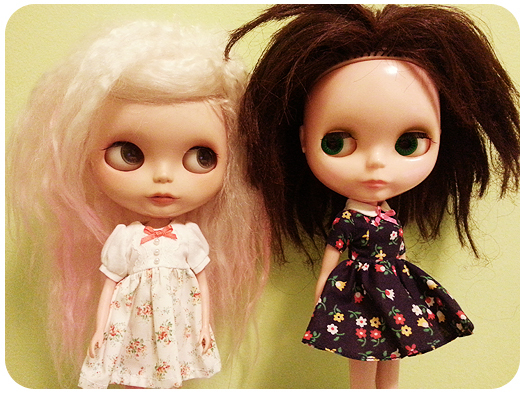 Sophie is wearing “vintage” Plastic Fashion and Belarus is wearing a crocheted dress by Charlene. Love Emmalynn and that Plastic Fashion dress! I love seeing all the pretty things you have gotten from others! 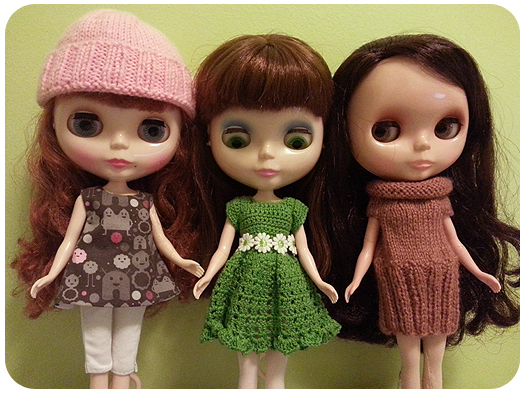 I too consider the doll clothes I have from other talented people to be part of my Blythe collection.